Dating isn’t for everyone and there are some people who have not gone on dates in five years or more. Sometimes we wonder why we still see these people falling into serious relationships. It’s because everything just falls into place. They don’t have to make it happen since they aren’t looking to be in a relationship. 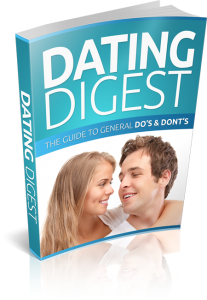 Now, if you have a relationship guide that discusses the do’s and don’ts of dating – you’ll have the upper hand. Obviously, you don’t want to meet your date wearing large suspenders, dirty boots, and oil stains on your face. Your excuse might as well had been “Oh, I decided to roll in the mud before I saw you”. By dressing well for your date, they will have a better judgment of you. Believe it or not but everyone judges someone, usually within the first few seconds of meeting. Anything that seems slightly out of place is easy for a person to pick up. For example, if you meet someone and you recently took off your class ring, they might think you are married. This is because they see the crease where the ring was. Even the smallest things can set them off and make someone think negatively of you. So today — in the next FEW MINUTES, in fact — we’re going to help you GET ON TRACK, and learn how you can quickly and easily get your dating issues under control… for GOOD! As a person just like you who has struggled with these issues, I have searched high and low to find the best strategies to fix this problem and I am fully qualified and equipped to help you put an end to your frustration with trying to wade through all the info you need to know to be a success at dating! Planning a date is relatively easy to do, if you’ve been in the dating game for a while. However, for someone who hasn’t been on a date in a long time – they might not even know where to start. This is where we come in to help you.